What Makes Fair Go Casino One of the Best Australian Casinos? 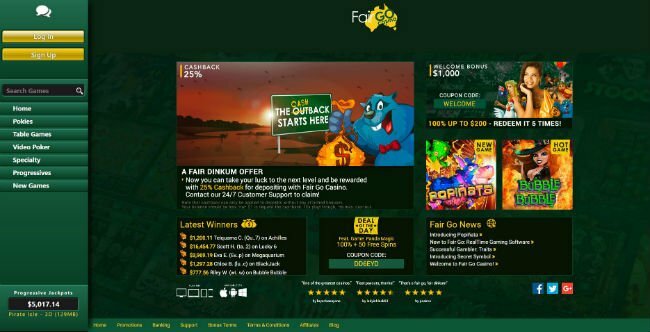 Fair Go Casino is an Australian facing gambling operator that provides the most entertaining slots to Aussie customers. There they go by the name of pokies, but they are still the same exciting games and players from all over the world enjoying them. The choice for software developers is also interesting and at the end of the day players are guaranteed to have a lot of fun. Their website is easy to navigate and the Australian theme is visible right from the start, so players feel like being in a unique place. For players from all over the world except for a couple of excluded countries, this is a safe gambling operator. Their games are audited for fairness and their license allows them to cater to all those who live in a place where online gambling is legal. For Fair Go Casino UK players, this is a good place to start thanks to the professional customer support fluent in English. The decision to go with Realtime Gaming can be a bit surprising given the fact that Fair Go online casino isn’t aimed at American players. The software developer is preferred by those operators, yet it has still plenty to offer to worldwide customers. Compared to other slot machines, these have an unmistakable theme and an innovative gaming metrics. There are several other online casinos who chose to embrace them and they stand out from the crowd as something unique and exciting. What makes the Real Series slot machines so unique among the Fair Go Casino games is the unmistakable charm they bear with them. They use the same framework as the classic games, yet the art packages and the themes are much different. The fact that you can also compete for progressive jackpots is a plus. The thing about Fair Go Casino jackpots is that they are won locally as opposed to other places where they are shared over the entire network. As a result, competition is less intense but the prizes are also smaller. Realtime Gaming is a software developer that has constantly innovated the gambling industry. Fair Go online casino features all their latest titles and by far the most enthralling are the new six reel slots. Green Light, Hillbillies Cashola, Megaquarium, Megasaur, Orc vs. Elf, Vulcan, Super 6, The Big Bopper, Spirit of the Inca and Enchanted Garden II are the most popular. The slots might be the most popular of all Fair Go Casino games but they are definitely not the only ones available. Players will have a lot of fun exploring the entire RTG library that consists of table games as well as video pokers. They don’t carry progressive jackpots and you need to bet more to win similar amount, but they have their unmistakable charm. Consider playing Blackjack, Baccarat, Caribbean Stud Poker, Tri Card Poker or Vegas Three Card Rummy against the random number generator. American and European roulette as well as craps and different types of baccarat and blackjack can be enjoyed against real dealers. You will find the croupiers friendly, fluent in English and always ready to meet you halfway. Fair Go online casino has far more video pokers than the average online gambling operator. This is amazing news for those who want to make the transition from slots to more challenging type of game. Deuces Wild, Jacks or Better, All American, Aces and Eights, Joker Poker, Bonus Poker, Sevens Wild and Double Jackpot Poker can be played here. Fair Go Casino free spins can be claimed on slot machines exclusively, but video pokers have their own bonus rounds. Use the right strategy and you will increase the odds of winning far above the standard payout ratios. Speaking of which, these can be consulted before playing any of the games as they are clearly displayed. Feel free to have fun with these games, while gambling on a mobile device. As a new player, you will be presented with the introductory offer of $200. Make the first deposit and the casino will double it up to this amount. This is just the first step because the next four investments will have the same result and will make your online gambling experience much more enjoyable. If you follow through with this entire pattern of deposits, you will receive up to $1,000 as a welcome bonus or currency equivalent in matching funds. Play slots, table games or video pokers to meet the wagering requirements and cash out. The minimum deposit consists of $20 and you will find this threshold to apply to all the bonuses offered by the casino. Try to make it count by claiming all the bonuses the casino offers initially before moving on to other Fair Go Casino promotions. Speaking of which, consider the special mobile bonus that once again goes all the way up to $200. Make a deposit between Monday and Thursday and you will receive an additional Fair Go Casino free spins pack. As many as 30 of them can be collected by active players. There is also an instant cashback bonus of 25% of the losses suffered over the course of each week. The reimbursements will be made on the first day of the week, namely on Monday at noon. The play through demands couldn’t be easier to meet, since you only need to bet the total amount 10 times. All the games qualify and you can use smartphones and tablets powered by Android and iOS operating systems. The popular Fair Go Casino banking methods include Visa, MasterCard, Neteller, Skrill and Paysafecard. The reliable wire transfer is also featured and you can also deposit and wager in Bitcoin. Feel free to use any of these financial instruments to load your account as you won’t miss out on the bonuses they offer. Every now and then, selected payment methods will result in additional bonuses for those who use them to deposit and cash out. The Fair Go Casino withdrawal waiting time can differ based on your banking option of choice. Wire transfers are the slowest, followed by credit cards, why e-wallets and crypto currency can be faster. What is even more important is that players always receive the money they withdraw without paying hidden fees or commissions. RTG casinos in general and this one in particular are auditing their games for fairness, so another major concern is waved. When it comes to Fair Go Casino customer support, they have an amazing lineup of specialists ready to take care of every single client. English is the language of choice but you can have the website translated in other languages if you fancy. Someone will be ready to take care of you 24/7 telephone, email or live chat. All channels of communication are available to existing members with or without a funded account. 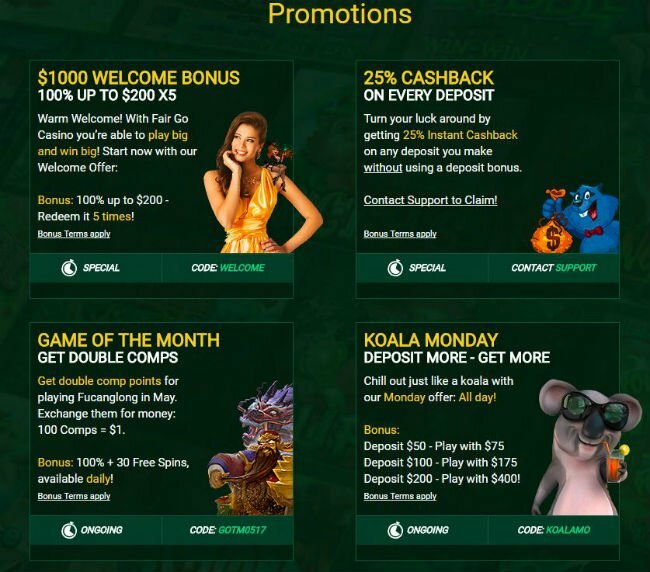 It’s quite difficult to come up with a better choice for Australian players than Fair Go Casino. These guys know what they’re doing and they’ve been at it for quite a while, constantly improving their service. International customers will be equally impressed by what lies in store, not to mention that the unique theme will appeal to them right from the start. Plenty of payment methods are covered and even though the Australian dollar is the default currency, one can switch to USD, EUR or GBP. Realtime Gaming software runs through their veins, one that can be trusted and guaranteed to be enjoyed at every turn. Players who take advantage of all the Fair Go Casino deposit bonuses and occasional promotions will be a healthy bankroll. Don’t take our word for it but check it out for yourself!